Let’s talk about politicians and how the main stream media treats them for a moment or two. Obama has made some gaffes in front of big audiences and so has McCain. Obama is clearly very comfortable with a teleprompter and McCain is not. In general, Bush 42 is not comfortable in front of an audience at all, but from what I hear, he is quite coherent and comfortable speaking to small groups about policy issues; he makes his points and opinions very clear. Why is it considered news when McCain can’t pronounce Lexington when reading from a teleprompter? 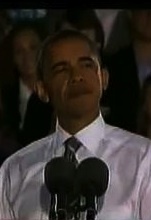 Why is it not news when Obama just fumbles and fumbles when he’s off a teleprompter? Why the hell does this matter? We all know that the MSM is giving Obama break after break after break on his gaffes in front of audiences but Mark Liebovich over at the New York Times feels it’s necessary to point out that John McCain has not quite gotten down the pronunciation of Lexington and go into complete details about the nuances of John McCain’s speaking engagements. Internet access today provided by Quality Inn Cigatoo in Governors Harbour in Eleuthera. Can Obama curb Congressional pork projects?